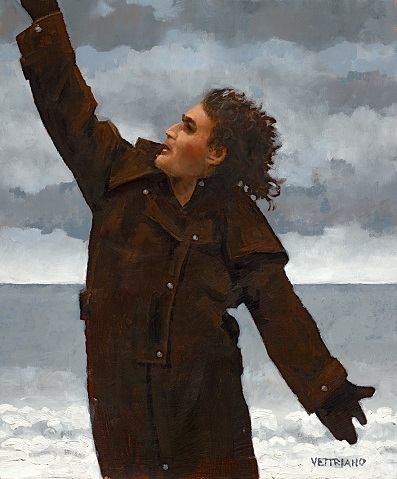 The latest artwork by Jack Vettriano to go on display is of Billy Connolly. Vettriano is one of 3 artist's to have 50ft murals of the much loved Glaswegian singer, actor and comedian adorning Glasgow as the city pays tribute to Billy in his 75th year. While Billy is in the hearts of many, Vettriano has also painted sportsmen and royalty and even an actress. 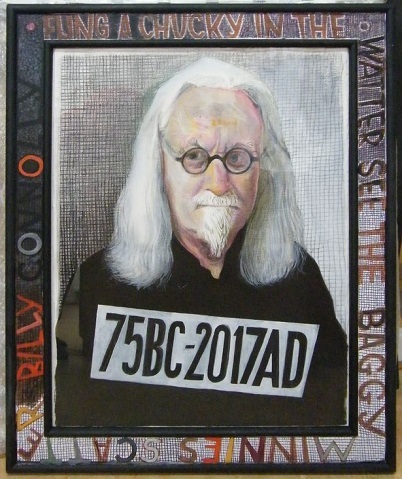 Billy Connolly - Dr Connolly, I Presume? 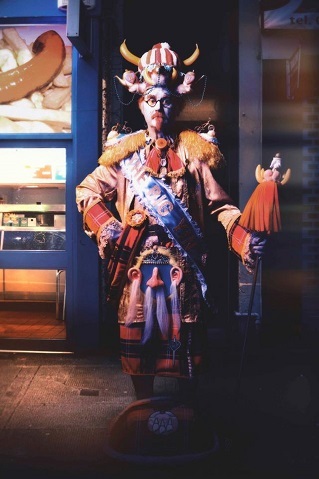 Jack Vettriano, Rachel Maclean and John Byrne were asked to create original works of art to be displayed in the People's Palace in Glasgow and also to be reproduced as 50ft murals to be displayed throughout Glasgow City Centre. If you are in Glasgow you can find Vettriano's Dr Connolly, I Presume? in Dixon Street. Rachel's Big Yin can be found in Gallowgate and John Byrne's portrait is in Osborne Street. John Byrne's painting features Billy as he is now. The BBC documented each artist and Billy's reaction to the murals in a programme called Billy Connolly: Portrait of a Lifetime. You can see Billy's reaction to the paintings below. Vettriano released Dr Connolly, I Presume? as a Limited Edition Print. The print sold out within a few hours, at the publishers and with us. The People's Palace in Glasgow also sold out quickly. We believe this to be the fastest selling Limited Edition of Vettriano's to date. Not surprising with such a loved Scottish icon as Billy Connolly. In 2008, Jack Vettriano, was commissioned to paint Zara Phillips as part of the Sports Relief charity fund raising project. Zara, the Queen's granddaughter and an Olympian silver medalist, was pictured in a chair draped with a Union Jack. The original painting of Olympia was auctioned at Bonhams in aid of Sports Relief and raised £36,000 for the charity. Later released as a Limited Edition Print, it is one of Vettriano larger prints, measuring 16 x 20 inches. Only 100 Limited Edition Prints of Olympia were released. They are now only available on the secondary market. Olympia comes in a dark frame which completes it beautifully. It is not surprising Olympia is one of our most requested prints! Vettriano's triptych of Jackie Stewart and his wife, Helen, was painted in 2010. Inspired by Sir Jackie's second Monaco Grand Prix win 1971, the 3 original paintings are held by Sir Jackie. Tension - features Sir Jackie walking towards the starting grid in preparation for his race. Triumph - an emotional embrace celebrating his victory. "I was astonished to be reminded that the cars were, as Jackie puts it, 'petrol tanks on wheels' and it really touched me to see just how involved the wives and girlfriends were in the whole process of the race. To see footage of Helen and the other wives recording lap times and keeping charts so that the information could be relayed to the drivers by mechanics on hand-held boards seems incredible now. What those courageous drivers risked back then defies belief but as an artist what interested me was the love story that has spanned this astonishing sporting career. It is this, the romance, that I hope I have captured in these three paintings." Tension, Timing and Triumph is available as a Limited Edition Print, which has been signed by both Sir Jackie Stewart and Jack Vettriano. The actress was Vettriano's model for Suddenly One Summer. Jack approached Kara after her Strictly Come Dancing win in 2010 and asked her to pose. Suddenly One Summer features Kara Tointon in a 1950's style turban with an Aston Martin. “I once had a relationship with somebody I shouldn’t have. We used to meet, we both used to drive to a certain spot and then one day she just never turned up. The subject of another BBC documentary "What do Artists Do All Day?". 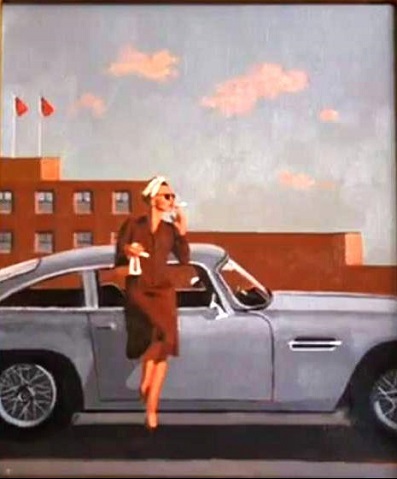 The documentary shows the development of the painting from the initial photographs of Kara posing with the car to Vettriano's creation. A fantastic opportunity to see how a painter takes his initial idea through to the final production. You can view the programme here. Capturing the, now famous beach scene, when Daniel (Liam Neeson) met his son, Sam (Thomas Brodit-Sangster) for the first time, in the film Love Actually. Jack was asked to paint the picture in aid of the Red Nose Day charity in 2017. The 16 x 18 inch oil painting raised £25,000 for charity. 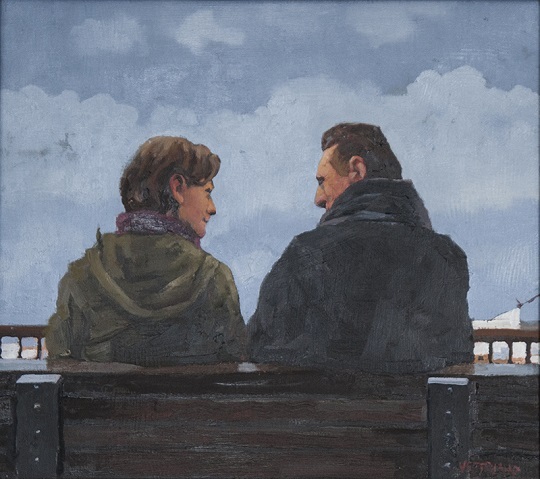 The Love Actually painting marked a return to painting for Jack Vettriano. He had been unable to paint for almost 2 years following an accident. 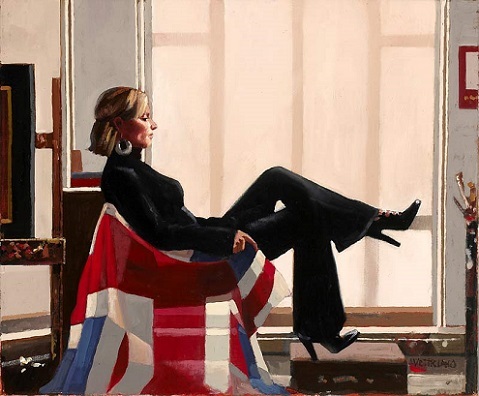 There we have it, Vettriano's paintings of Zara Phillips is our firm favourite. What's your favourite painting? Let us know in the comments below. Want to see more Jack Vettriano's paintings and prints? You can find them here.